Exclusive original jurisdiction to hear and determine disputes relating to the elections to the office of President arising under Article 140 of the Constitution. The Court has appellate jurisdiction to hear and determine appeals from the Court of Appeal and any other court or tribunal as prescribed by national legislation. As a matter of right where the case involves interpretation or application of the Constitution or a matter certified by the Supreme Court or the Court of Appeal as one that involves a matter of general public importance. The Supreme Court may review a certification by the Court of Appeal and either affirm, vary or overturn it. Determine the validity of a declaration of a state of emergency; an extension of such a declaration or any legislation enacted or action taken in consequence of a declaration of a state of emergency. Appeals from a tribunal constituted under Article 168 of the Constitution on removal of Judges from office. 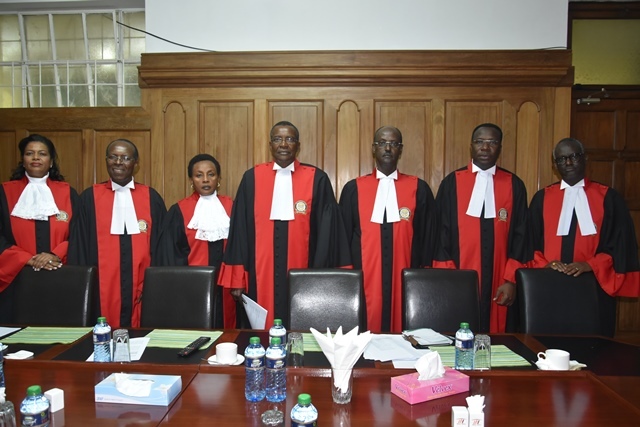 (L-R) Hon Lady Justice Njoki Ndungu, Hon Justice Prof J.B. Ojwang, Hon Lady Justice Philomena Mwilu, Hon Justice David Maraga, Hon Justice Mohammed K. Ibrahim, Hon Justice Dr Smokin C. Wanjala and Hon Justice Isaac Lenaola. The Easter Vacation of the Supreme Court shall commence on Thursday, 22nd March, 2018 and terminate on Tuesday 3rd April, 2018 both days inclusive. A Judge will be available during the vacation to deal with matters that are urgent or require prompt attention. During this period the Supreme Court registry shall be open to the public from 9.00a.m to 12p.m on all weekdays other than public holidays. State of the Judiciary and the Administration of Justice Report 2016 – 2017. State of the Judiciary and the Administration of Justice 2014 – 2015. State of the Judiciary and Administration of Justice Report 2013 – 2014. State of the Judiciary and the Administration of Justice Annual Report 2012-2013. State of the Judiciary and the Administration of Justice Annual Report 2011-2012. Click on the link below to download a summary of the fees and costs. The Supreme Court Registry is located in Nairobi. The Court may have other sub registries as the Chief Justice may determine from time to time.